As an impenetrable swampland, South Florida was one of the final frontiers for modern development in the Unites States. As such, it had an incredibly productive natural environment that supported a profusion of wildlife. 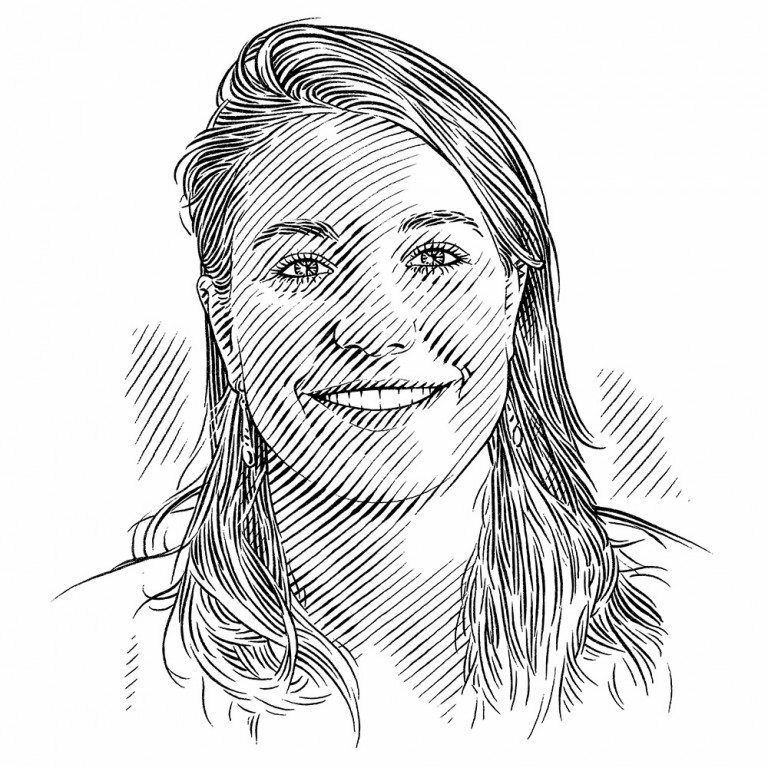 In more recent times, a rapidly increasing human population has turned the region into an urban jungle, but it seems that its marine inhabitants are finding ways to survive, often with the help of local researchers and conservationists. 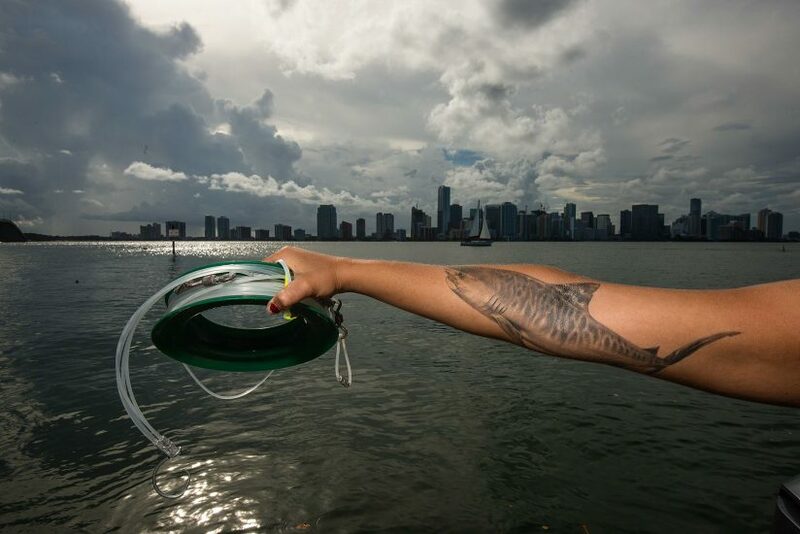 Following investigation by the University of Miami’s shark-tagging team, a blacktip shark Carcharhinus limbatus is released back into Biscayne Bay opposite the Turkey Point Nuclear Generating Station. 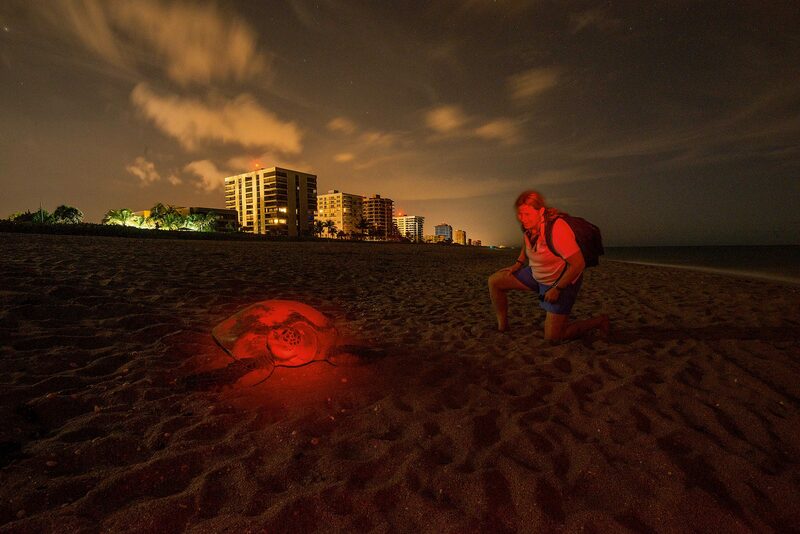 Just before midnight on a South Florida beach, a massive sea turtle comes to land on hard, wet sand at the edge of the surf. She hesitates. All her senses strain to pick up any imminent threat. This is the third time she has come up onto this beach tonight; twice she has U-turned, disturbed by voices or unfamiliar vibrations. By now she is frantic. It has been two years since she last came to nest and she will come ashore between three and five times before the end of the season. Eventually, satisfied that she is safe, she uses her powerful flippers to force her body up the sand. In the water she can move like lightning, but on land it feels like she’s trying to propel herself through treacle syrup. About 100 metres away, two colleagues and I sit in silence, watching the heavy black shape push herself up the sand. Behind us is a wall of high-rise buildings, as there is along most of the coastline of south-eastern Florida – although Jupiter is positively parochial when compared to the urban jungle of Miami further south. It is a perfect mild evening and, apart from a few red lights in the distance, the beach is completely dark. My companions are photographer Justin Gilligan and Dr Jeanette Wyneken, a leading turtle expert and professor at Florida Atlantic University. Jeanette has been working in South Florida since 1984 and has been based at Jupiter since 1990. Both Jeanette and Justin are anxious to get what they need from this turtle and we have already seen a number of U-turns tonight. The trick is to wait for her to start laying, when she will go into a kind of trance and allow us to get up close. After some time, Jeanette signals that we can approach. We walk along the shoreline until we find the end of the turtle’s track. From the interlocking strokes in the sand, Jeanette can tell that this is a loggerhead, a widespread and highly migratory species that is known to cross the Atlantic and Pacific oceans. We approach the turtle carefully from behind and Jeanette squats down next to her nest, pulling from it what looks like a soft white ping-pong ball. Loggerheads lay roughly 100 eggs at a time and it will take about two months for the young to hatch. ‘The hatchlings find their way to the water by fleeing tall, dark silhouettes. If there is a bright light, they are attracted to or disoriented by it, so instead of finding the sea, they are trapped by the light,’ she explains. Finding a way to deal with light trapping was one of Jeanette’s first challenges when she arrived in Florida. At that time, it was not unusual for her to get phone calls from Floridians saying ‘We’ve got sea turtles in our swimming pool’, ‘We’ve got sea turtles in our parking garage’ or ‘There are sea turtles crawling onto the highway’. 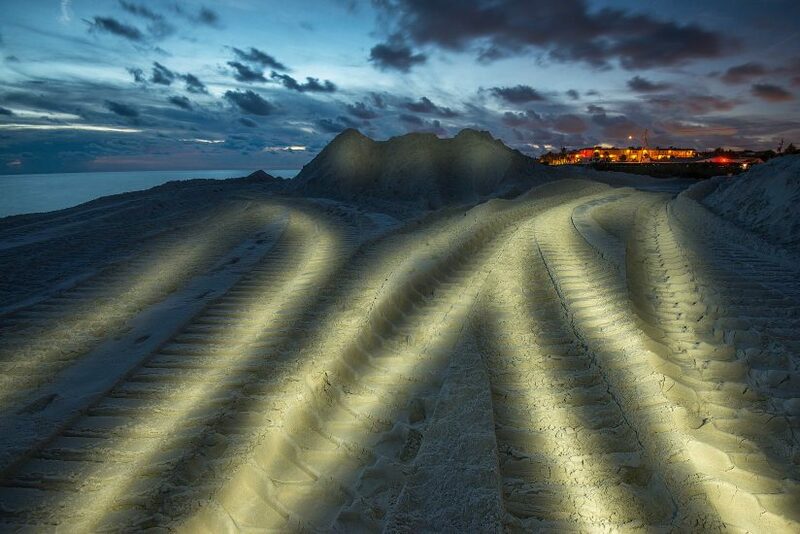 Much of the local human population is made up of retirees, so adequate lighting of beaches and buildings at night is a legitimate concern. Jeanette and her colleagues had to find a way to balance people’s needs and those of the turtles. ‘A lot of this has been an exercise in learning from people who do lighting,’ she says. ‘There have been several approaches and one of them was to understand what the turtles see. They don’t see red light, or at least not very well. When we found that out, we thought, “Okay, the turtles don’t see this spectrum of light very well, but people do.” That gave us a tool that would enable people to see without disturbing the turtles.’ Having found a way to avoid disrupting the turtles’ breeding attempts, she and her team then had to embark on a long-term education programme to inform Florida’s local municipalities and building managers and get them on board. With new people constantly trickling into the state, public education about lighting is an ongoing challenge. Hundreds of party-goers flock to the Haulover Sandbar on the Intracoastal Waterway north of Miami during the Fourth of July Independence Day holiday. As the turtle’s nest fills with eggs, Jeanette reaches over to touch her shell and I watch in amazement as a glowing zigzag follows her finger down the length of the carapace. The turtle has carried a thin layer of bioluminescence up the beach with her. 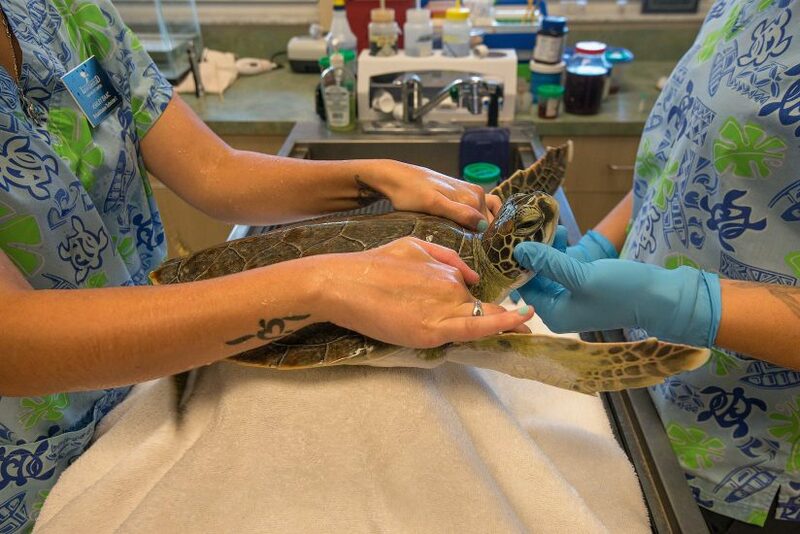 ‘Florida is producing virtually all the turtles in the North Atlantic – probably about 85%. So what happens to these animals in the Atlantic is driven by what happens here,’ explains Jeanette. Last year more than 15,000 loggerhead nests were recorded in the region, as well as 700 green turtle and 160 leatherback nests. For these animals, lighting is not the only challenge. ‘If you were to go back and look at what was happening in the late 1990s and early 2000s, the numbers then were declining and declining,’ she continues. 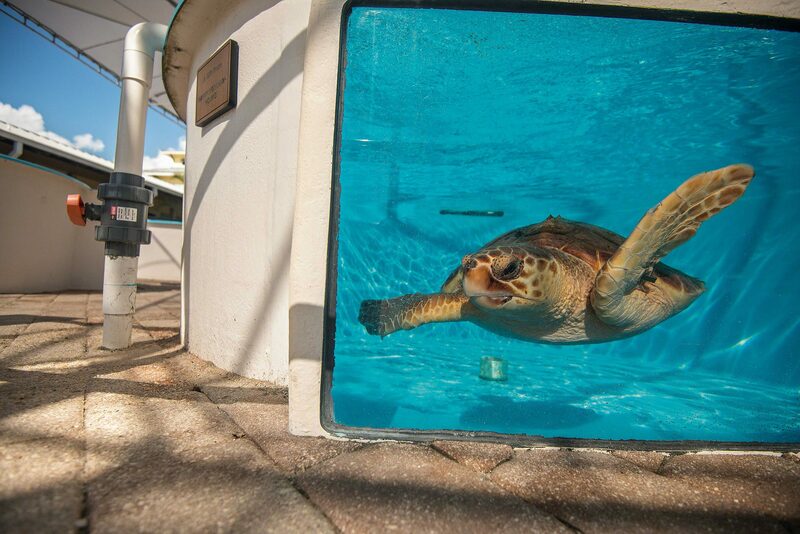 ‘Now we are seeing a big increase in loggerheads and that coincides with the implementation of the turtle excluder devices (TEDs).’ The deployment of TEDs in Florida was a major conservation success and meant that this population of loggerheads is still classed as Vulnerable rather than Endangered. Although TEDs may mitigate some anthropogenic threats, there are others that are harder to deal with. Turtles cannot outrun temperature increases and with cyclical as well as general global warming, this is a growing concern. Eggs and embryos are particularly vulnerable. Typically the hatching success rate is between 70 and 75%, but with last year’s El Niño it dropped to between 23 and 28%. Most of the embryos did not even develop and others died in the nest. Temperature also impacts gender ratios. There are always more females born than males, but last year all the hatchlings were female. Established in 1963, John Pennekamp Coral Reef State Park off the Florida Keys was the first undersea park declared in the USA. Healthy coral reefs, sea-grass beds and mangrove ecosystems thrive within the protected waters of the park. Another problem is Florida’s growing population of enthusiastic boaters. ‘When a turtle floats up dead, the most common thing is we don’t know what happened. The second most common thing is that it’s been hit by a boat,’ says Jeanette. Turtles did not evolve with ocean traffic and educating boaters about how to avoid turtles that are coming up to the surface to breathe is the latest frontier of turtle conservation in Florida. It’s now about 2 am on the beach and the loggerhead has covered up her nest and is starting her painfully slow return to the sea. It takes her many minutes to reach the surf, but as soon as she is immersed in water deep enough to float her huge body, she seems to dissolve into the dark Atlantic. Loggerheads grow to more than a metre (three feet) in length and there are records of adults weighing over 200 kilograms (440 pounds). Scientists are not sure how old these turtles get, but they only become sexually mature at about 35 years. An adult this size could be twice as old as that and when she hatched sometime around the 1950s, Florida – or ‘the Sunshine State’ – would have been a very different place. Jeff Trotta grew up in North Miami Beach in the years just after World War II. ‘In one lifetime we went from being a fairly low-density population to being one of the highest in America,’ he says. ‘There was an enormous influx of people from the 1940s into the mid-1950s. The population just kept on growing and eventually Miami became a large city. Florida was still regarded as an exotic location and housing prices were cheap because agricultural land was being used for building.’ With a current population of more than 20 million, Florida is now the third most populous state in the USA and, after California, attracts the second highest number of tourists. The state’s unique ecosystem is one that has been most impacted by human-induced change. The Everglades was a vast swampland created by brackish waters in the south merging with fresh water flowing out of Lake Okechobee in the north to form a very wide, shallow and intermittent river. But the draining of this enormous wetland has turned it into the largest water drainage district on the planet. ‘There’s only one of this type of system in the world and we’re it,’ explains Jeff. ‘But it’s been channelised and dyked and ditched and reclaimed and built on, so now we have a much smaller area and it is under pressure because the water isn’t going where it would naturally flow. If they didn’t keep pumping it out, the Everglades would return.’ Although now no more than a fraction of its original size, the Everglades is still a critical wildlife habitat for numerous species, including the smalltooth sawfish, and continues to play a critical role in shaping the marine environment of southern Florida. The secret behind the Sunshine State’s enduringly abundant and diverse ecosystem is the waters that feed it. There’s the Gulf Stream, a flow of warm, clear water pumping a few kilometres offshore that is loaded with plankton. 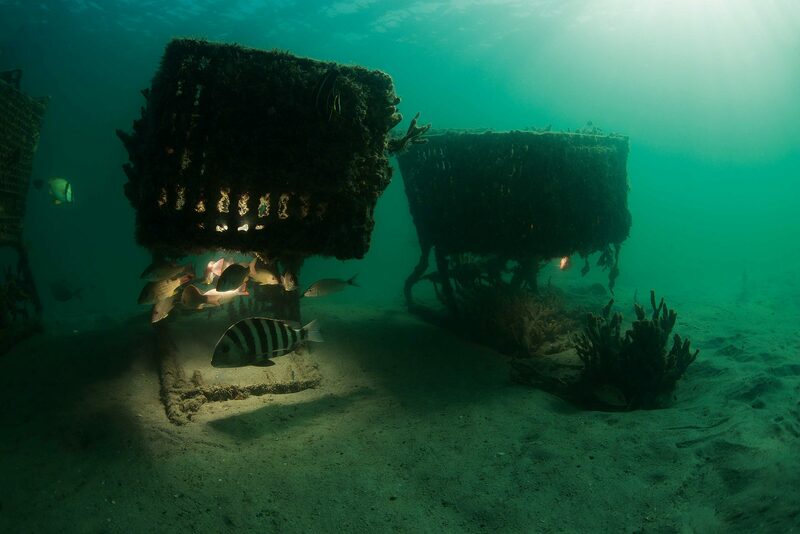 And combining with this, a nutrient-rich outflow of sediment and silt pours out of Florida Bay, while what remains of the Everglades provides a rich smorgasbord for the entire marine food web. The effect of this bounty can be most clearly observed in the Florida Keys, a chain of limestone islands that formed between the Gulf of Mexico and the wider Atlantic Ocean. ‘If you look at the morphology of the keys, you see an opening in the chain of islands, a major pass where water flows into and out of Florida Bay and bathes the edge of the shelf. That is where there are really high concentrations of sharks and sawfish because that is where the productivity is,’ explains Dr Dean Grubbs, the current president of the American Elasmobranch Society and associate director of research at Florida State University. 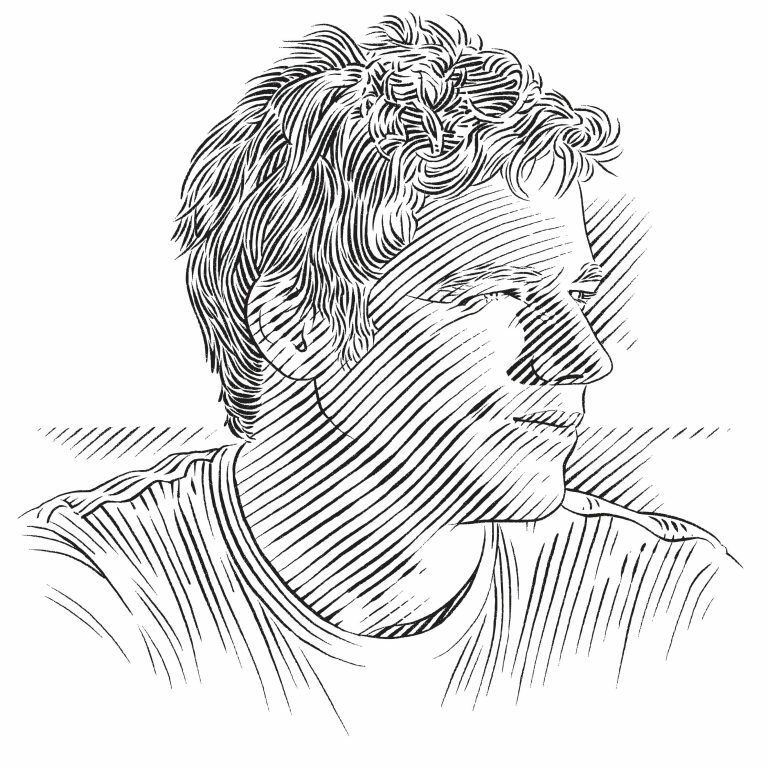 He has been studying the habitat use of sawfishes in the Everglades since 2010. ‘Most of the nursery grounds occur in the 10 000 islands of the Everglades National Park region and then the adult habitat occurs from the southern part of the Everglades throughout the Florida Keys,’ he adds. The Florida Keys National Marine Sanctuary protects 2,900 square nautical miles of water and includes the world’s third largest barrier reef, extensive sea-grass beds and mangroves, as well as more than 6,000 marine species. Historically the Florida Keys was a celebrated destination for big game fishermen, with large sharks being prized catch. Today there has been a shift in public attitudes towards sharks, with Floridians being more tolerant, respectful and conservation minded. It’s mid-afternoon on the overseas highway. Beyond the narrow bridge Justin and I are driving along, the view stretches across overwhelming spaciousness to distant horizons in all directions. Belying the general perception of ‘overseas’ as an exotic, faraway destination, the overseas highway is a 182-kilometre-long concrete snake built literally over the sea to link the islands of the Florida Keys from Miami in the north to Key West in the south-west. We are currently travelling between Islamorado and Upper Matecumbe Key. At the end of the bridge we take a sharp right into Robbie’s Marina, a famous spot where visitors can get a taste of what this part of Florida is all about. I hear shrieks of excitement long before we reach the large pier that juts out just to the left of a busy restaurant. People are queuing to buy buckets of bait and out on the jetty parents dare their children to lean out over the water and tempt the monstrously large fish below. 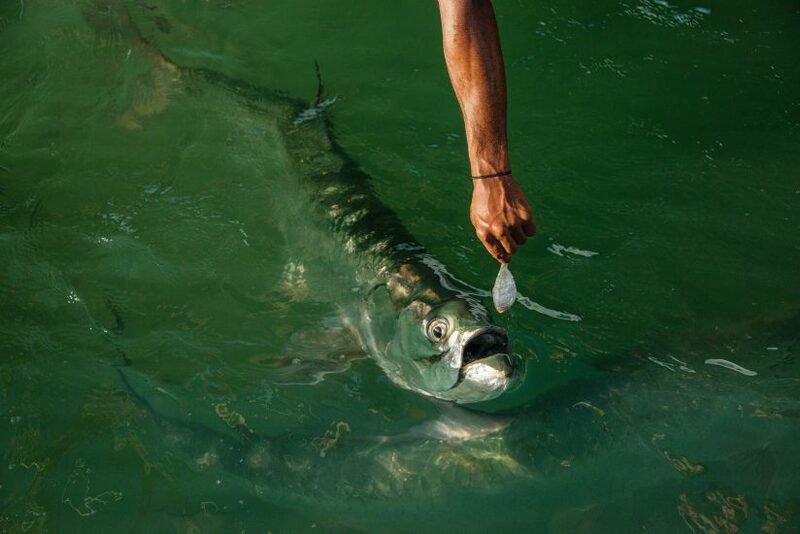 I watch as a little girl recoils in shock as a huge tarpon, black mouth agape, smashes through the surface and relieves her of her offering. With wide eyes and a pale face, she quickly hands her bait bucket to an older sibling. There is a lot of commotion on the other side of the pier where visitors are jostling to get a glimpse of a blimp-shaped grey creature that has just surfaced. The somewhat mangy-looking manatee is much smarter than it appears. Almost on cue, one of the well-trained visitors picks up a hosepipe to spray fresh water onto the animal, which happily twitches its whiskery face in thanks. Its shower is interrupted by a woman who scolds the onlookers for encouraging the manatee; with so many boats moving in and out of the marina, this is a dangerous place for it to be. 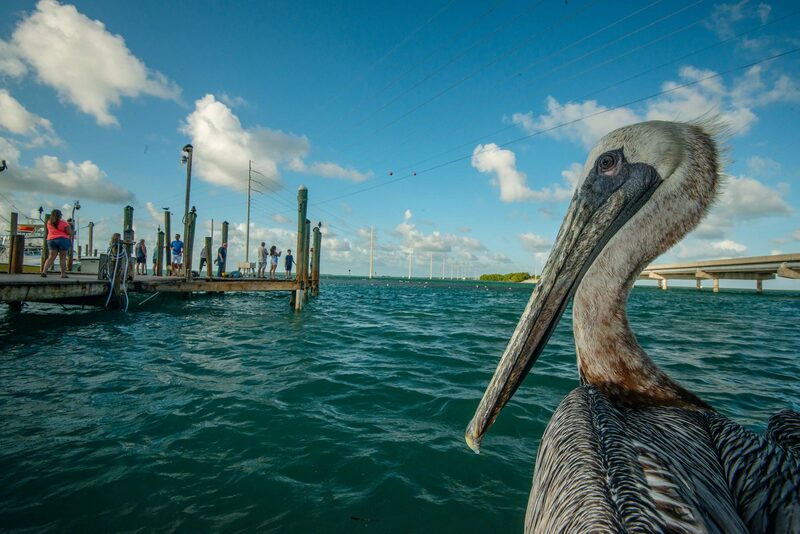 This may be far from a pristine wilderness, but when it comes to meeting some of Florida’s wild inhabitants, Robbie’s Marina is guaranteed to deliver. 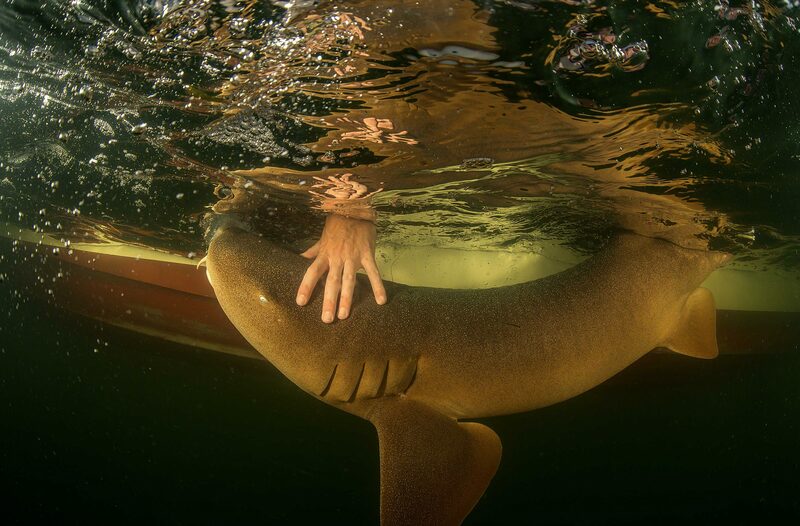 You can see manatees, brown pelicans and tarpon within half an hour and if you get here at the right time, you will be treated to the feeding of conditioned nurse and lemon sharks as well. 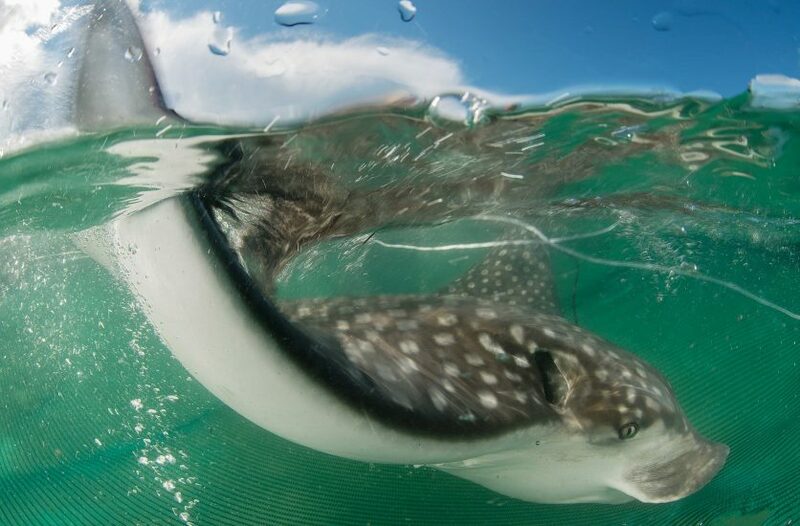 Despite having one of the largest shark fisheries in the USA, Florida has followed the global trend in adopting a more understanding attitude to sharks in recent decades. ‘I think opinions have changed dramatically in the past 20 years. Twenty years ago, if you brought a great hammerhead into a dock in the Florida Keys, everyone would want to come and see it. They would want to take photos with it and that kind of thing. If you were to do that now, you had better get security, because people are going to be after you. Folks just don’t tolerate that sort of thing any more,’ reflects Dean. Floridians enjoy a morning walk while in the shallows a massive school of baitfish passes one of the many inviting beaches located between the Intercoastal Waterway and the Atlantic Ocean north of Miami. 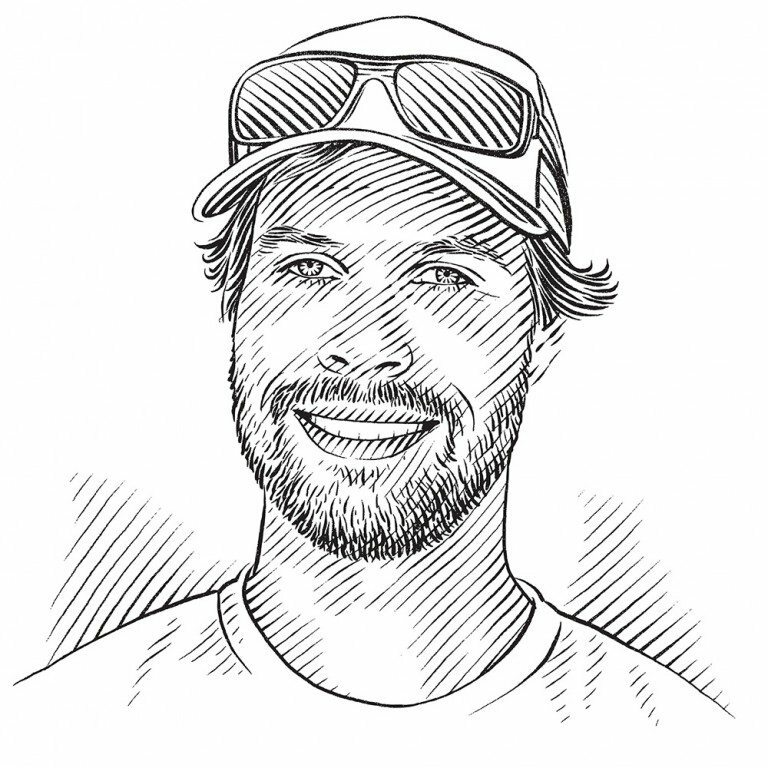 Working between Biscayne Bay in the north and the Everglades in the south, Neil is using tracking technology as well as physiological data to investigate who these winners and losers might be. 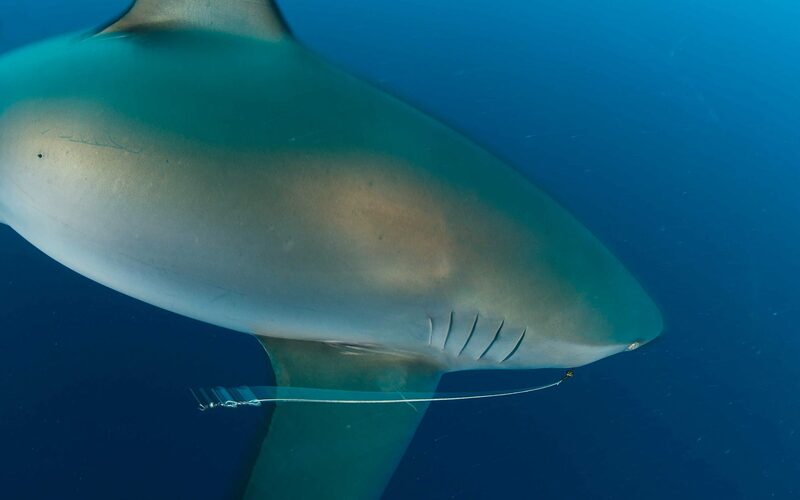 The species he and his team encounter most are bull sharks, blacktips, nurse sharks and hammerheads. In addition to tagging the animals, they are looking at hormones like serotonin and trying to understand the sharks’ nutritional condition by testing triglycerides and the amount of fatty acids. Much of this research is fundamental, as we will have to learn what a hormone like serotonin means for sharks before this knowledge can be applied specifically to an urban environment. Paul Verian of Finn-Atic Fish Co. bags a speared lionfish Pterois volitans off Fort Lauderdale. Commercially exploited to supply restaurants throughout the USA, this invasive species is thought to have been introduced through the aquarium trade. In the absence of predators, it has thrived off Florida and in the Caribbean. Fortunately for the survival of some species, Floridians offer a helping hand. On my last day in Florida I find myself on a large dive boat heading away from the shore of Jupiter Beach and out towards the mighty Gulf Stream. This trip has been organised by the Loggerhead Marinelife Center (LMC), in collaboration with a local dive company. In addition to running an impressive public education programme, the centre plays a critical role in conserving the local turtle population by monitoring nests and rehabilitating about 100 injured sea turtles every year. Today we are making the trip to release a green turtle named Susan. She is on the deck, strapped to a turtle-shaped stretcher, and has been at the centre for almost a year after colliding with a boat. Next to her are two large, flat Tupperware containers writhing with turtle hatchlings that did not make it to the sea on their own. Once we reach the open ocean, the boat slows and the LMC team lifts Susan to the end of the boat and releases her into the water. For a turtle that has been in captivity for so long, she moves pretty quickly and barely gives us enough time to get a photo before she is gone. Dr Mahmood Shivji, director of the Guy Harvey Research Institute and Save Our Seas Shark Research Center (Nova Southeastern University), examines a shark fin. A major focus of his research is the application of modern molecular genetic techniques to investigate trade-related issues in elasmobranchs. Releasing the hatchlings is a more complicated procedure as we need to find a decent-sized mat of sargassum. These floating islands of seaweed provide a critical space for the young turtles to hide in and find food. Being about as big as a quarter, the little animals need as much protection as they can get. After more than an hour of searching, we eventually find what we are looking for and I drop into the deep, clean waters of the Gulf Stream to follow the procession of tiny turtles that are being released one by one. I have never seen a young animal with a survival instinct as frantic as that of a newly hatched turtle. From the second it is born, its ‘swimming frenzy’ will last for up to a few days, until it reaches the open ocean. Even inside their container, the little creatures were desperately ‘swimming’ over one another. Now in the water, I watch in amazement as they nestle into the sargassum, pull in their flippers and float like a motionless army of marine Mars bars. It is humbling to see these tiny parcels of life begin their journey within the immensity of the Atlantic and I am reminded of a thought I have had over and over during my time in Florida. As humans, we have spent thousands of years learning how to pioneer our way into natural places and we have been extremely successful. Yet nature is designed to continue and somehow in Florida our fellow species are finding ways to forge their futures in the environments that we create. ‘Sometimes I am aghast, you know? I have dived in some of the most remote places in the world. And yet you can go to Palm Beach County, Florida, and jump into the water and anything can happen – and it does. It’s still pretty good, you know?’ Jeff Trotta had said during our interview a few days earlier. Looking back at the busy city skyline while surrounded by an army of tiny loggerheads, I have to agree with him.